If you don’t teach the whole child, which part do you leave out? When it comes to our youth, who are the promise of tomorrow, we can’t afford to leave anything out. The Graduate at Graduation is a guiding document comprised of forty-three goals that all Saint Patrick Catholic School students aspire to achieve by graduation. 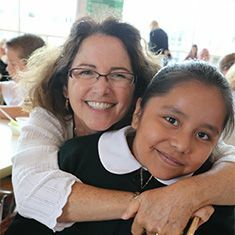 This document drives Saint Patrick’s student programming as well as our mission to develop the whole child, socially, academically and spiritually. Unlike externally driven performance standards, these goals are intended to inspire student motivation and foster student autonomy in self-reflection and decision-making. Students have opportunities throughout the school year to reflect on how well they are achieving these goals and on what they need to do to reach goals not yet realized. The creation and use of a "Journey Portfolio" is one of many ways students reach the goals set forth in the Graduate at Graduation. In answering the great life question of, “Who am I?,” students at Saint Patrick begin to develop an understanding of what they stand for and their individual core values. In an oftentimes confusing and ambiguous society, the knowledge of self is a powerful and freeing gift that can illuminate a student’s path for a lifetime. Exhibited confidence and skill in public speaking. Demonstrated a creative intelligence and imagination in a variety of disciplines. Shown the virtue of teamwork and cooperation through team sports, clubs or community projects with peers. Demonstrated a practical understanding of human behavior. Developed an understanding of conflict resolution and successfully applied it in daily living. Developed a commitment to service, especially to the poor. Demonstrated a sense of economy and balance in one’s life. While I was a student at Saint Patrick, I had close relationships with my teachers. When I got to high school, I found that I had an advantage over my peers in my ability to create relationships with my teachers and to advocate for myself. On May 1, 2009, Saint Patrick Catholic School was recognized by the William Glasser Institute as a Glasser Quality School. 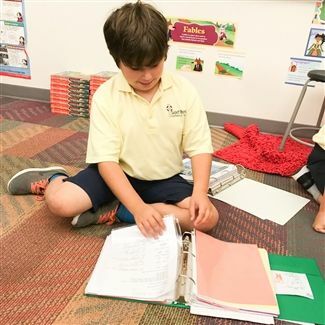 Saint Patrick Catholic School has established its school program on some of the best practice and research available. Among the educational reformers that we have given particular attention to is Dr. William Glasser. Dr. Glasser’s contribution to education focuses on the promotion of healthy relationships and their impact on high quality education. His life work centers on theories of human motivation and behavior. His problem-solving techniques form the basis of how our school promotes student participation in identifying and attaining their goals. Relationships are based upon trust and respect, and all discipline problems, not incidents, have been eliminated. Total Learning Competency is stressed and an evaluation that is below competence or what is now a "B" has been eliminated. All schooling as defined by Dr. William Glasser has been replaced by useful education. All students do some Quality Work each year that is significantly beyond competence. All such work receives an "A" grade or higher, such as an "A+". Students and staff are taught to use Choice Theory in their lives and in their work in school. Parents are encouraged to participate in study groups to become familiar with the ideas of Dr. William Glasser. Students perform better on state proficiency tests and college entrance examinations. The importance of these tests is emphasized in the school. Staff, students, parents and administrators view the school as a joyful place.